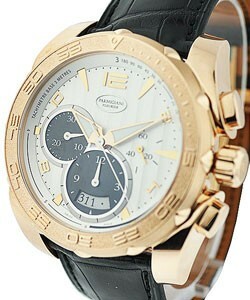 Michael Parmigiani was fascinated by luxury watch craftsmanship at a young age and undertook watchmaking training so that he could become a craftsman. 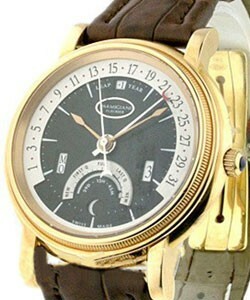 He then devoted himself to restoring timepieces up to 450 years old by working with museums and collectors. 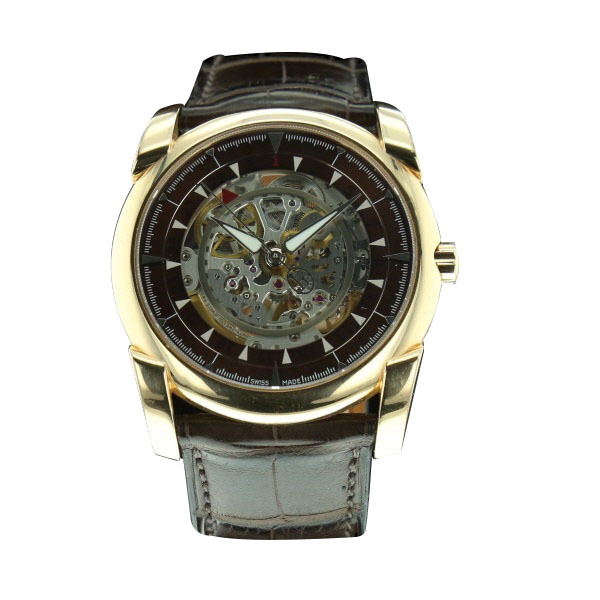 By learning the history of watchmaking through experiencing it, he is uniquely placed to create watches that utilize the best that history has to offer while also learning how to envision the future. He has continued the tradition of exceptional quality in his own company that was built with the help of the Sandoz Family Foundation. 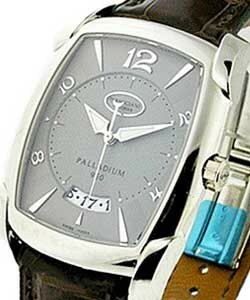 In fact, Parmigiani luxury watches move from conception, development, machining, casing and decorating totally in house at Parmigiani Fleurier. 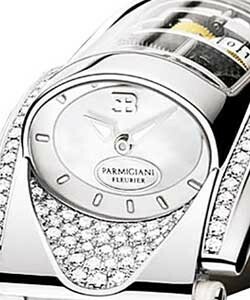 Parmigiani luxury watches for both men and women are hand crafted with care to be assured that the finest craftsmanship goes into each element. 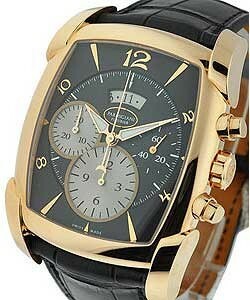 There are simple models that are beautiful in their elegance as well as models with exciting complications. The women's collection includes different watches that can be worn every hour of the day or evening, and for every activity. 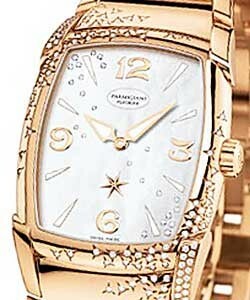 The 'Parmigiani Kalpa' models incorporate both gold and steel and some include diamonds on the watch face, bezel, case or band. 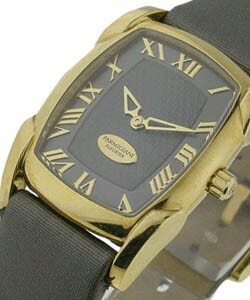 The beauty and elegance of these models make it easy to see why they are so popular. 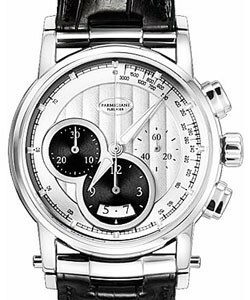 Popular complications include the 'Parmigiani chronograph', the 'Parmigiani fly-back chronograph', the 'Parmigiani perpetual calendar', and the 'Parmigiani tourbillon'. 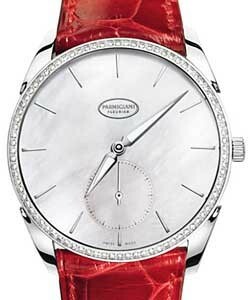 Parmigiani luxury watches for men include the Kalpa models as well as all of the same exciting complications that the ladies' watches incorporate. 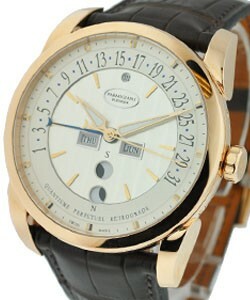 The 'Parmigiani Toric Retrograde Perpetual Calendar' is a favorite, as is the 'Parmigiani Bugatti Type 370'. 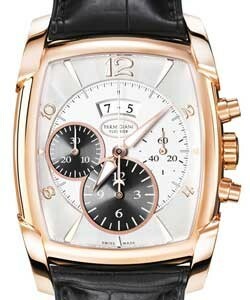 The men's watches also include technical masterpieces with grand complications, such as the 'Parmigiani Pershing Tourbillon', and the 'Parmigiani Toric Minute Repeater GMT'. 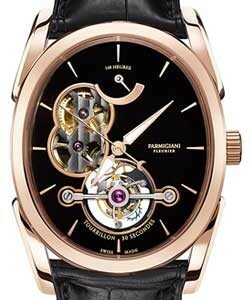 With such attention to detail and individual creation, the Parmigiani luxury watches produce relatively small numbers of their watches and one can understand why some of those with high complications are rare treasures to be sought after and collected.